In line with fulfilling his inclusive governance mandate, on Thursday 14th of April 2016, Lagos State Governor, Mr. Akinwunmi Ambode, met with residents of Ikorodu during the quarterly Town Hall Meeting, which is the 3rd in the series since the commencement of his administration on the 29th of May, 2015. During the quarterly meeting, His Excellency, Governor Akinwunmi Ambode gave a detailed report on the developmental achievements of his administration in the last 11 months. 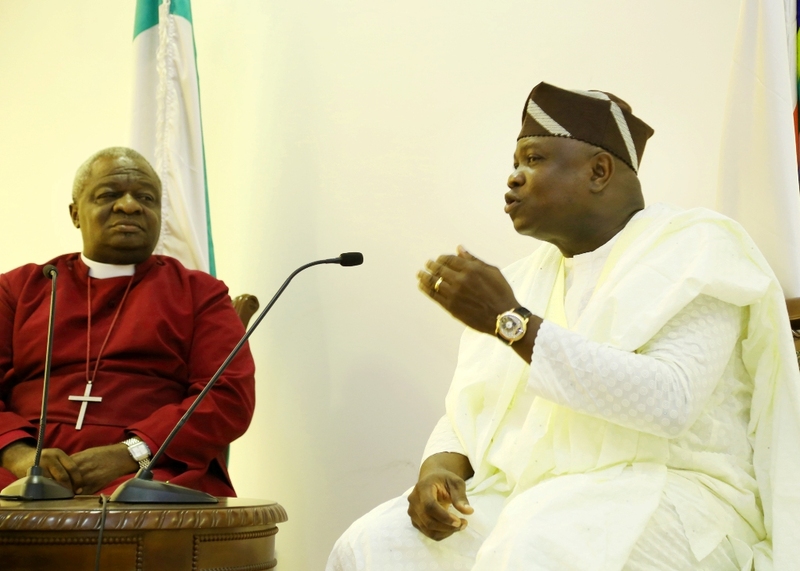 During the briefing, the Governor touched on investment and business oriented collaborations the state had sealed to fast-track economic growth, and also, the efforts of his administration to position Lagos as a destination choice for Sports, Tourism and investment in Africa, he also touched on the electrification project – essentially the Light up Lagos Project, which spans across different parts of the state. Further highlighting some of his administration’s strides in the last quarter, Governor Ambode said the State achieved major breakthrough in security, saying that since the launch of the N4.78 billion equipment, the state had won several battles against crime. He said the quick response in the rescue of the kidnapped girls in Ikorodu and the quelling of the Mile 12 riot were testimonies of the effectiveness of the security system in State. He added that many criminals had so far been arrested since the launch of the security equipment, saying that he was ready to pay for information given that would lead to the arrest of hardened criminals. “I am ready to pay monetary compensation for information on hardened criminals as we proceed to make Lagos crime-free. We are happy to report that crime rate has also reduced in the last three months,” he said. On attracting investment to Lagos, Governor Ambode said investors have shown interest in the redevelopment of the fish market to an international Fish Market and the redevelopment of inner roads in Epe and Ibeju-Lekki. While addressing issues on transportation in Lagos, Governor Ambode said before the end of May 2016, the State Government will formally sign a Memorandum of Understanding (MoU), with investors for the construction of the proposed 4th Mainland Bridge. He further assured residents that once the MoU is signed, work would begin on the 4th Mainland Bridge, emphasizing that the project would go a long way to boost the economy of Lagos East Senatorial District. “Many investors have shown interest in the actualization of our dream for the 4th Mainland Bridge which will run from Ajah to Ikorodu to Isawo and berth at Ojodu, Ikeja back to the Ibadan expressway. 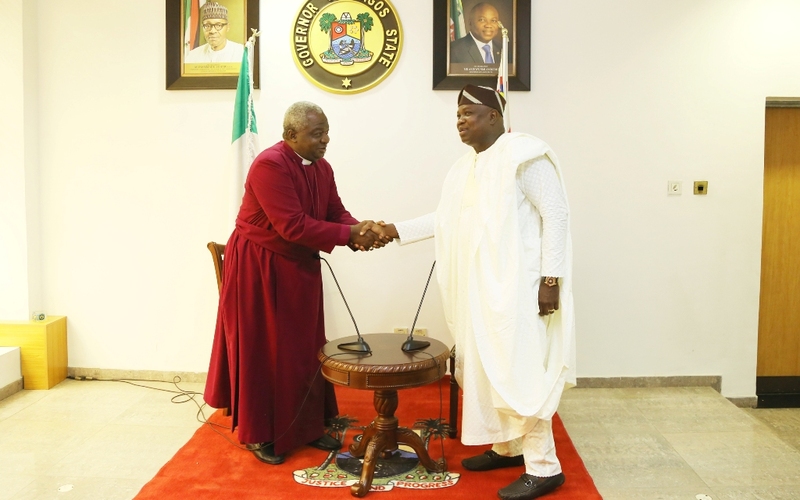 By the grace of God, we will sign an MoU and commence action before May 29”, he said. According to Governor Ambode, his administration is keen of inclusive governance. Saying no one, or any part of the State will be left behind or underdeveloped. The Governor expressed optimism that the Lagos East Senatorial District which used to be the economic hub of the state in the then Western Region will regain its position in a short time. “Over the years, the economic activities have continually dwindled resulting in urban migration, underdevelopment and unemployment. It is with a view of revitalizing the economic activities of this zone that Government has identified the need for urgent intervention. 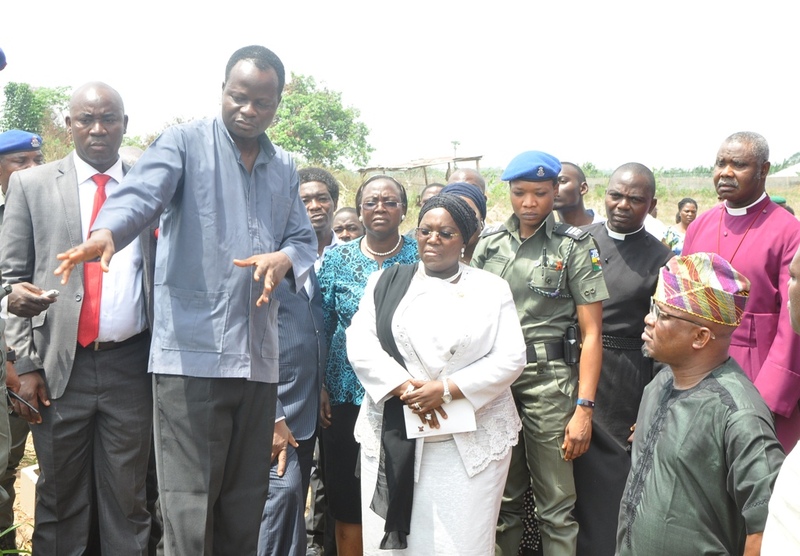 “To this end, Government will be relocating the Mile 12 Market to Imota. Work on this will commence next week. Our vision is to make the East Senatorial Zone economically viable and liveable”, he said. During the question and answer section, His Excellency responded to complaints by residents on the menace of motorcycles, otherwise known as Okada in the State, Governor Ambode asked the people whether they would support a total ban on such mode of transportation in this age and time and in a city like Lagos, a question which was answered in the affirmative by majority of the stakeholders in the hall who raised their hands in support. “I’m encouraged by this very transparent, credible, free and fair affirmation which I just got from the people. From the response, many of the people in this hall are in support of a total ban on Okada and since this is a government of the people, all the security agencies in Lagos including the Police, Task Force, LASTMA and others, to start with, are hereby directed to fully enforce the ban on Okada between Mile 12 and Ikorodu. “We will not tolerate Okada on the road and I hereby emphasize that there is no more Okada on Mile 12-Ikorodu Road. Anyone caught flouting this directive will have their Okada impounded and we would prosecute such people as well before the court,” the Governor said. Speaking on the need for the youths in the state to key into the programmes lined up for them by his administration, Governor Ambode urged street urchins and youths involved in social vices such as cultism to lay down their arms and shun violence, assuring that they would be empowered to be gainfully and productively engaged. He said the plan of his administration is that youths, artisans and entrepreneurs in each of the Senatorial districts and divisions in the State would be able to access at least N1billon between now and June, and use same for their greater economic prosperity, and by extension that of the State. Governor Ambode, who also responded to pleas by residents in Ikorodu on the need for the expansion and rehabilitation of the road network, assured that government will explore the Public Private Partnership (PPP) initiative to transform the Ikorodu-Imota-Agbowa-Itokin-Epe Road into a standard 8-lane Road. Governor Ambode, directed the Ministry of Energy and Mineral Resources as well as the State Electricity Board to look at the possibilities of providing electricity for Igbo-Olomu community, a suburb in Ikorodu, which has been without light for over 10 years. Closing the question and answer segment of the quarterly meeting, Governor Ambode appealed to Lagosians present to ensure that they continue to pay their taxes, and also take ownership of projects in their domain. In over a month from now, this administration will be one year in office and I am happy to report that in the last 10 and half months, this government has embarked upon several high impact projects; some completed while many are still ongoing. All of these are the outcome of our strategic and methodical plan to deliver a Lagos that is safe, clean and prosperous. In the last two Quarterly Town Hall meetings, the 1st in West and the 2nd in Central, we have reported the achievements of the government under the various sectors. Today, we will only highlight some key achievements and listen more to you. We want to hear from you so that we can serve you better. Before I hand the proceedings over to you, let me brief you of some key highlights in the last quarter. We realise that one of the ways to fast-track our economic growth is through collaboration and partnerships. As a result we entered into a partnership with Kebbi State for the establishment of a commodity value chain for the production, processing and distribution of commodities such as Rice, Wheat, Groundnut, Onions, Maize/Sorghum and Beef. This activity is majorly in the East Senatorial zone. In the last quarter, Lagos State joined the Odu’a Investment Group. This is a major landmark in the South-Western states’ efforts towards regional integration and will benefit our State immensely. The State has also entered into an agreement with the Federal Government to redevelop the National Museum at Onikan in line with our resolve to use tourism, hospitality, entertainment and sports to drive growth and development of the State. We have also commenced negotiations with Namibian Investors in the areas of Tourism and Hospitality, especially on creating parks and resorts from the many open spaces in the State. Local Investors are also welcome to this thriving sector. In the last quarter, as part of our efforts to position Lagos as a destination choice for Sports, Tourism and Investment in Africa, we hosted the Maiden Edition of “Lagos City Marathon”. This was a big success. We will sustain the event on an annual basis as well as continue to host other International Sporting events in order to improve Tourism in the State. Our commitment, determination and massive investment in security equipment in the last few months has yielded positive results. The prompt rescue of the kidnapped Babington Macaulay Junior Seminary Girls by Security Agents and the quelling of the recent Mile 12 crisis in the State are pointers to this. Many criminal elements who had terrorized parts of the State have been arrested and will face the full wrath of the Law. I am ready to pay monetary compensation for information on hardened criminals as we proceed to make Lagos crime-free. We are happy to report that crime rate has also reduced in the last Three months. The Lagos Light Up initiative of this administration is up and running. In this quarter, we connected 68 Communities in Lekki/Ise/Odeomi in Ibeju Lekki Local Government Area of the State, who had been without electricity for 5years, to the National Grid. We have also commissioned the street lights from Ile Zik in Ikeja to the Sango old toll gate and from the Murtala Mohammed International Airport to Oshodi. Street lights have also been installed and retrofitted on many roads too numerous to list here. We would give greater attention to Ikorodu and its environs immediately. The contracts for the construction of fly-overs in two of the State’s high traffic zones – Ajah Roundabout and Abule-Egba Junction were awarded and work has started. These two projects will be delivered on schedule this time next year. Work has also started on the Berger pedestrian bridge. Work is at an advanced stage on the Ajasa Command and Aboru-Abesan link road to ease traffic on the Lagos-Abeokuta expressway and link the various communities. The phase 1 of the Lagos Blue Line rail is now 85% completed. We are happy that better attention is being paid to the East Senatorial Zone. Road construction is ongoing in Epe, Ikorodu, Somolu and other places. The Board of the State Employment Trust Fund has been constituted and N6.25b, which represents the State government’s commitment to the Fund for Year 1, has been paid to the Fund. By the next quarter, we will report the successes of this Fund in terms of beneficiaries and employment. I have recently assented to the amended Lagos State University Law and approved the appointment of a Vice-Chancellor for the institution. A Provost has also been appointed for Adeniran Ogunsanya College of Education, Otto Ijanikin. In the last quarter, the State government paid over N561m for 46,000 candidates that are sitting for the WAEC examinations this year. With the various measures to reposition the Education Sector and guarantee quality control, Lagos State Schools will soon be amongst the best centers for learning in Africa. Our hard working Health Officials initiated quick action plans to curb and eradicate the recent outbreak of Febrile Rash disease commonly known as Measles at Otodo Gbame Community in the Eti – Osa Local Government Area of the State. Our Health Officials also contained the outbreak of LASAA fever. In order to manage such incidents in the future, we have reactivated isolation Wards in LASUTH and 26 General Hospitals for the isolation of any suspected case. Let me use this opportunity to appeal to all Lagosians to be vigilant and cooperate with our Health Officials in the various Local Governments and Communities by reporting any strange illness to the nearest health facility. We have launched the Priority Actions Document to end all forms of violence against Children. We have set up a channel in the Ministry of Women Affairs and Poverty Alleviation (WAPA) for abused individuals to report cases of domestic and sexual violence to the government. We have also trained first responders to effectively deal with each reported case. We launched mobile courts to try traffic and environmental offences. This will guarantee citizens’ access to justice and at the same time ensure order and civility is preserved in the society. Ladies and Gentlemen, historically, Lagos East Senatorial Zone was the economic hub of this State in the then Western Region as it served as a link between the hinterland and the waterways leading outside the country. Over the years, the economic activities have continually dwindled resulting in urban migration, underdevelopment and unemployment. It is with a view of revitalizing the economic activities of this zone that Government has identified the need for urgent intervention. To this end, Government will be relocating the Mile 12 Market to Imota. Work on this will commence next week. Our vision is to make the East Senatorial Zone economically viable and liveable. In the same vein, many investors have shown interest in the actualization of our dream for the 4th Mainland Bridge which will run from Ajah to Ikorodu to Isawo and berth at Ojodu, Ikeja back to the Ibadan expressway; the redevelopment of the fish market to an international Fish Market and the redevelopment of the inner roads in Epe and Ibeju-Lekki. Let me reiterate the commitment of this Administration at ensuring that no part of this State is left behind in our quest towards development. This government is methodically and strategically pursuing our programmes to put Lagos on the world stage as a megapolis. Please pay your taxes and take ownership of the projects we have initiated and together, we will build the Lagos of our dreams. I solicit your support in ensuring the full realization of our policies and programmes to achieve our goal of a safe and prosperous Lagos. Itesiwaju Ipinle Eko, lo je wa logun. 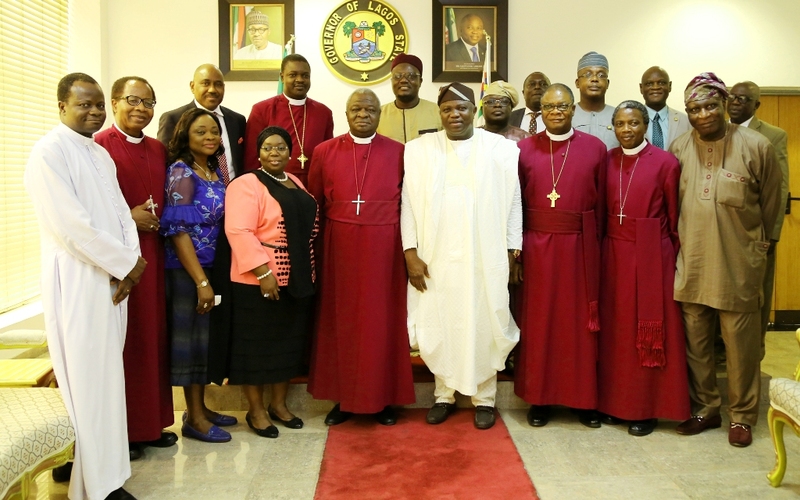 Anglican Archbishop of Ecclesiastical Province of Lagos Mainland Diocese, Most Rev. Adebayo Dada Akinde on Mondaycommended the administration of Governor Akinwunmi Ambode, saying the prompt, positive and practical response of the government contributed largely to the success story of the safe rescue of the three female students of Babington Macaulay Junior Seminary, Ikorodu. 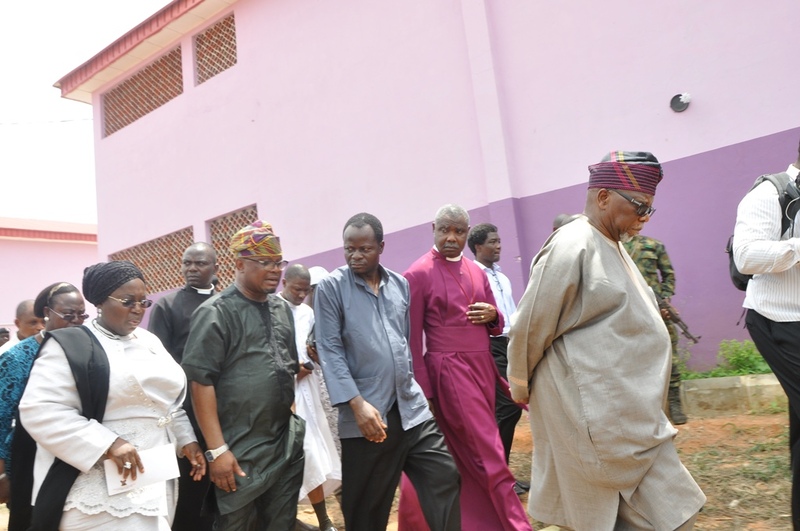 Akinde who led other bishops of the Anglican Church, Principal of the school, Ven. 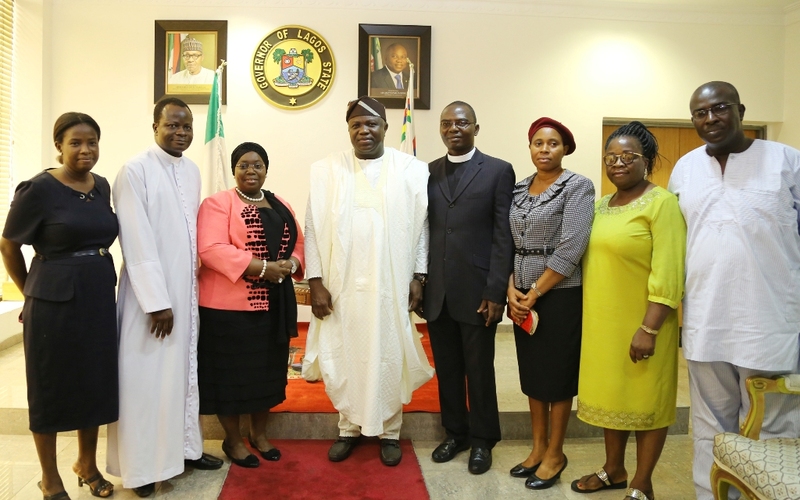 Olaoluwa Adeyemi and parents of the three rescued female students on a “thank you” courtesy visit to the Governor at the Lagos House, Alausa, Ikeja, said the success story of the rescue of the girls cannot be complete without the laudable efforts of the Lagos State Government. He said he and his team deemed it fit to come and appreciate the role played by the state government in the wake of the abduction of the students from the school on February 29 and particularly the role of Governor Ambode. “It was a most traumatic moment and sad for us as proprietors. Today we are thanking God for his intervention that a most unfortunate and traumatic event ended on a joyous note. “All three pupils are now safe in the custody of their parents, they have been reunited. You acted and responded. Your response was prompt, your response was positive, your response was practical. “So when we talk about this success story of the return of the three female students, your Excellency your contribution is most overwhelming, you have shown yourself to be a passionate leader, a leader that is interested in the well being of the citizens of the state that God has placed you as the Chief Executive Officer at this time. “So the main objective of our mission here is to express immense thanks to your Excellency for the support you gave us. We are saying thank you, we are indeed grateful, you have started well as the Governor of the State, God will grant you the grace to continue and improve in the name of Jesus. 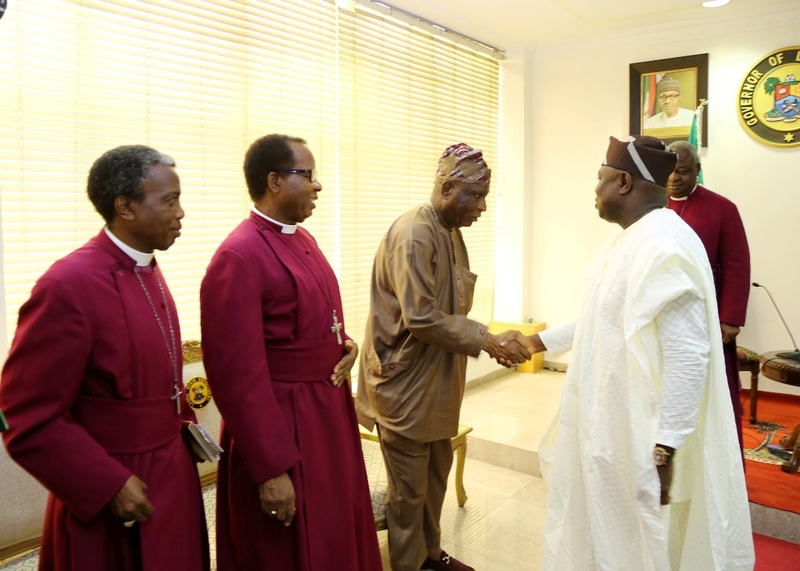 We sincerely appreciate you and are immensely grateful,” Bishop Akinde said. Also speaking, Principal of the school, Ven. Adeyemi said they were indeed grateful for the support encouragement and prayers they received from several quarters while the ordeal lasted. He said with the security apparatus put in place by the state government, it was game over for those who have taken to crime in Lagos. “No hiding place for criminals in Lagos now, because for the event that took place in the past few days and that God in his infinite mercy helped us and the security agencies did their work well and the girls are with us now. They are back in school and have reunited with their parents. I believe that God is working in Lagos,” he said. One of the parents of the recued girls, Ven. Ayo Olusan said they were relieved with the return of their girls, saying the prayers offered by Nigerians and the prompt effort of the state government played a huge role towards the rescue of the girls. Responding, Governor Ambode said the incident was a test of the government’s commitment to the security of lives and property in the state. “Seven days ago, the unthinkable happened, but again, we give all the glory to God that seven days after we are able to pride ourselves that one of those principal duties that you have charged this administration with is what we have just proved. “We took it personal, not because it was a private school, not because it was far away from the metropolis, but because we all decided to say that if it were our own child or children, are we going to sit down? That is the real focus of what this administration is all about. For everything that happens we put ourselves to imagine that if it were us, what would be said about our actions and inactions. “We are very grateful to God for giving us that opportunity to prove that the welfare and well being and the security of the people of Lagos is what is paramount to us as an administration. “It’s just for me to reiterate that the security of lives and properties is of paramount interest to this administration, we will do anything to make sure that the security of lives and property is sustained, is enhanced, because at the end of the day that is the only way we can grow the economy of Lagos,” Governor Ambode said. Governor Ambode also sent a strong warning to criminals to desist from their nefarious activities, warning that his administration is poised to spread its security searchlight to every nook and cranny of the state. “We know that Lagos is safe, we are reiterating once again and sending a final warning signal to all the criminals and miscreants that have been disturbing the peace of Lagos, this time around, we would be in every nook and cranny of Lagos to secure the lives of everyone,” he said. 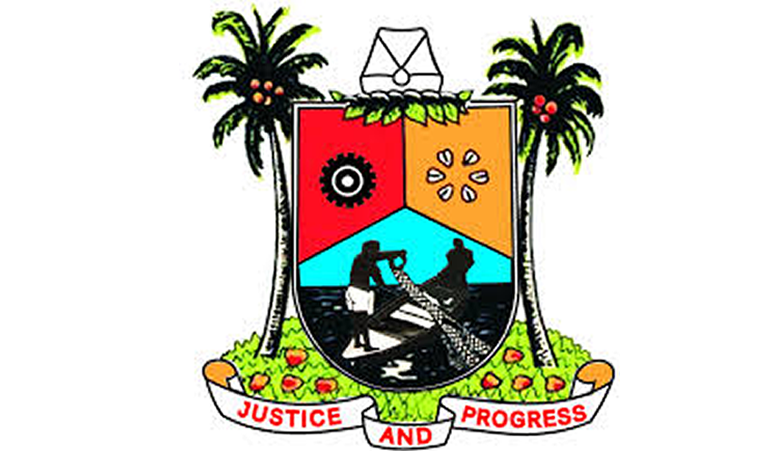 Lagos State Governor, Mr. Akinwunmi Ambode on Sunday said his administration has the will and capacity to fight all forms of crime and criminality in the state, just as he read the riot act to persons who have taken to kidnapping, warning that there would be no hiding place for such act. The governor, who addressed journalists on the safe rescue of the three girls abducted by gunmen from the Babington Macaulay Junior Seminary School in Ikorodu last Monday, warned that the state government will spare nothing to clamp down on all forms of crime in the state. “Let me warn that the State Government will not tolerate kidnapping or any forms of crime in the State. Our position is clear and unambiguous, Lagos state has the capacity and the will to go after every form of crime and criminality in order to safeguard lives and property in the state. He expressed relief and excitement at the rescue of the girls by security operates in the early hours of Sunday, just as he commended the efforts of security operatives who led the rescue efforts. “The Lagos State police Command, the Department of State Security and members of the Armed forces worked tirelessly round the clock in the last six days to secure the release of the children. I thank them for a good job. 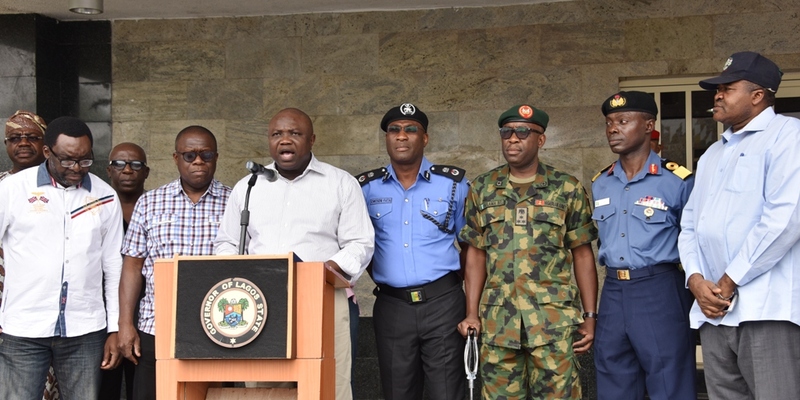 “The three girls have been safely re-united with their families and the Government wishes to assure Lagosians that their security is top priority and it will not relent in ensuring that Lagos remains safe and secure,” he said. 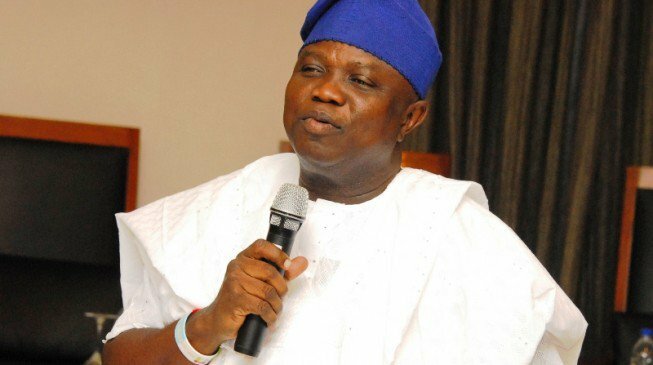 Governor Ambode said one of the suspected kidnappers – one Emmanuel Arigidi, was arrested during the operation by security operatives to release the abducted children. “As our daughters are re-united with their mothers and other members of their families, I would like to seize this opportunity to wish all mothers in Lagos State and Nigeria at large a happy Mothers’ Day,” he said. 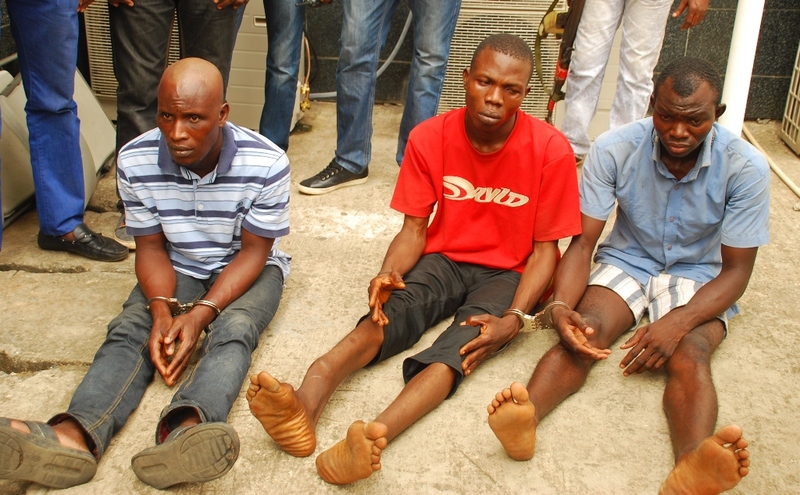 Also, the State Commissioner of Police, Mr. Fatai Owoseni said three suspects were arrested in the operation that led to the rescue of the girls, adding that one of the suspects (Emmanuel) was actively involved, while two others – Seun Akanji and one Henry were conspirators who aided the kidnapping one way or the other. Owoseni disclosed that the girls were rescued around Imota in Ikorodu, but declined to disclose further details in order not to jeopardize ongoing investigation. When asked if ransom was paid, Owoseni said nothing of such happened as police deployed intelligence-led policing using the platform of technology and partnering with members of the community to put pressures on the kidnappers to secure the release of the girls. He added: “When you talk about ransom in cases like this, you are glorifying kidnapping. We should not be talking about ransom anymore in this country because if you do, you are telling others that kidnapping is viable and you can be going and kidnapping people to collect money. “But I want to also say that what was employed in rescuing the girls is more of application of intelligence-led policing using the platform of technology, partnering with members of the community and pressures on the kidnappers because what we have done with other security agencies is that we also went for members of their families including their mothers, their fathers, their children and with that pressure they found out that there was no way again for them to keep on keeping the girls and that was what led to the success we recorded in rescuing the girls,” the CP explained. He assured residents that Lagos remains safe and secured saying that the state government and security agencies have the capacity to pursue any criminal who dare at all to come and disturb the peace or to commit crime in the state. When interviewed by journalists, the prime suspect, Emmanuel Arigidi said twelve people were involved in the operation and that the operation was planned at Majidun area of Ikorodu. He said: “We went to Maya bridge to enter Canoe and went to the school around 8pm. After we gained entrance into the school, we took away three girls and we took them to our hideout. But along the line, we had disagreement between ourselves and I was actually the one that started it. I told other members of the gang that what we have done is not good and that I don’t like it. “I know that security in Lagos State is now tight and I was telling others that there was no way we would get away with this kind of job considering the level of security in the state. When I told them that we should end the assignment, other members of the gang threatened to kill me and then I took Canoe to run away. “Three days after I ran away, operatives of the Special Anti-Robbery Squad (SARS) then arrested me somewhere in Majidun and that was how I told them how we planned the attack. One thing I will like to say is that if not for the fact that I was arrested, they would not have seen the girls because I was the one that revealed everything to the police,” he narrated. Deputy Governor of Lagos State, Dr. (Mrs.) Idiat Oluranti Adebule on Wednesday paid a visit to the Babington Macaulay Junior Seminary School, Ikorodu, where three female students were kidnapped on Monday evening, assuring that the government was fully on top of the situation. Adebule, who was accompanied by top government functionaries and the heads of security agencies in the state, said as a mother and Commissioner of the Ministry of Education, she could imagine the pains the parents are going through as a result of the unfortunate development, but that government would leave no stone unturned until the three girls are rescued alive. She said the state government, under the leadership of Mr. Akinwunmi Ambode, was very much concerned about the plight of the affected parents and the school, and that it was on top of the situation and working hard in conjunction with security agencies to promptly reunite the children with their families. She also appealed passionately to the kidnappers to release the girls immediately, as the victims were innocent of whatever reasons that prompted their action. The Deputy Governor said: “On behalf of the Governor and all of us in the Ministry of Education, we are here to share your pain and off course to see firsthand what has happened on Monday. The Governor has directed that we assure you and the general public that with the combined efforts of all the security agencies that the children, by the grace of God, will be rescued very soon. “This came as a rude shock to us because nobody anticipated it; it’s quite unfortunate and very worrisome but I like to assure you that by the grace of God, we are going to receive good news very shortly. “For the abductors, I just want to appeal to them that they should see that the people with them are children who do not know anything and in the spirit of that and the fact that they also have their children, they should release the children to their parents. We appeal to their conscience that whatever reasons they might have for doing this, the children are innocent and we passionately appeal to them to release the children. “For the parents at home, they should just be calm, government is on top of the situation and we want to assure that with the combined efforts of security agencies, we will rescue these girls alive very soon. Again, as the Commissioner of Education and as a mother, I feel the pains of the parents and I like them to know that our hearts are with them and the state government under the leadership of his Excellency, Mr Akinwunmi Ambode will leave no stone unturned in ensuring the rescue of these girls very soon,” Adebule said. 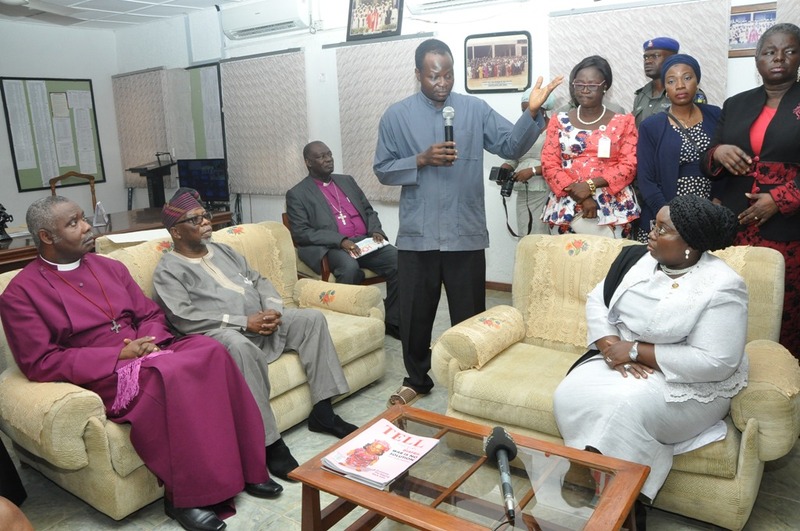 Earlier, Proprietor of the School and Bishop of Remo Diocese of Anglican Church of Nigeria, Dr. Michael Fape commended the state government for the quick response to the distress call made on the kidnap, saying the action of government and the security agencies were encouraging and assuring that the girls would soon be rescued. “We can’t thank you enough. We are sure these girls will be rescued. And of course the way the Lagos State Government has risen to the task of rescuing these girls also gives us a lot of encouragement. “The Governor himself and the Commissioner of Police and every one of them have been on top of the situation. Their efforts have been so encouraging and we sincerely thank them. We thank your Excellency for finding out time to come here in person despite your tight schedule. As Bishop in charge of this diocese, we have only come to see things for ourselves too. 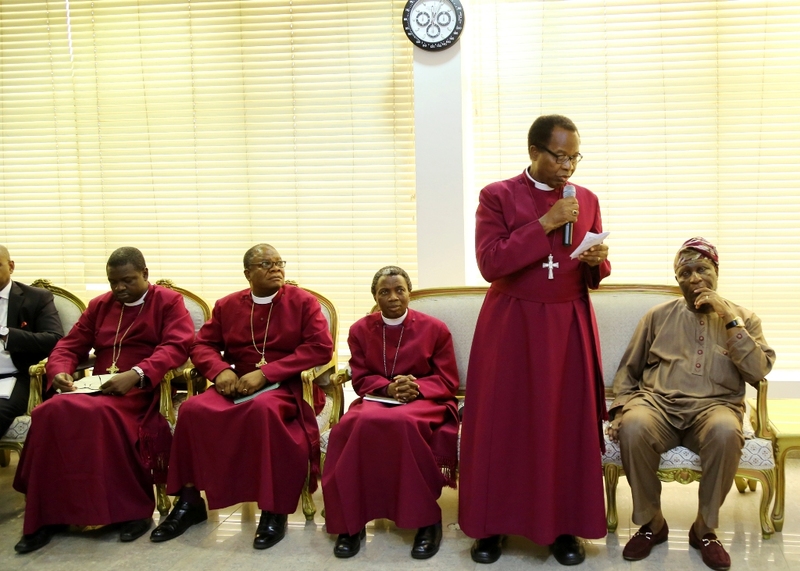 We trust God that God on our side and the efforts being put in place by the state government, these children will be recovered”, the Bishop said. ,Also, the Principal of the school, Ven. Olaoluwa Adeyemi told the Deputy Governor and her team that the kidnappers gained access to the school premises through a deep hole they effected on the fence of the school. He said after the kidnappers gained entrance, they started shooting sporadically into the air, and eventually overpowered the security personnel in the school, as the hoodlums came with superior weapons. Adeyemi added: “The security in school tried to combat them but the weapons they came with were very heavy. They went into the classrooms; the students in fact put up a good fight but the kidnappers overpowered just about three students and whisked them away. “Immediately, we called the Commissioner of Police, Mr. Fatai Owoseni because fortunately I have his number and immediately the Governor was informed and within the space of two to three hours, the school was filled with security people. All the security agencies combed the environment here till morning. Apparently, we could not get them but since then, security people have been really working hard. “We like to appreciate the Lagos State Government in particular for the quick response. Everybody have been coming; the police, DSS. In fact, the CP himself led the helicopter surveillance yesterday and they went all around. “We have spoken this morning and he is on his way here. We pray that God will crown the efforts with great success and our children will be back with us save and sound. God will intervene and Nigeria will be a better place for all of us. “Three children were involved and we have contacted their parents and tried to discuss with them and other security information are with the security agents,” he narrated.